A lot of our working day is spent using online platforms and services. No matter how many different platforms you use during the course of your workday, one thing is for sure: you want to spend as little time as necessary registering for a new product or signing in to a product you use regularly. Once you register, it’s a matter of remembering which password you used, and memorizing all those passwords really isn’t the most fun thing to do. We are aware of how precious your time is, and we kept that in mind during our latest update. To streamline the registration and sign-in process, it’s now possible to connect your Google or Microsoft account to Lily and sign in for future sessions with the press of a button and skip having to enter an email address and password. For current users, if you originally registered for Lily using a Google or Microsoft email, you can use that account to login. For new users, they will be given the option to register with a Google or Microsoft account in order to continue logging in that way. You can also choose to register without connecting your Google or Microsoft account, just as was possible before this update. If you do choose to connect your account, we will not store your credentials in Lily, but instead, you will be redirected through Google or Microsoft to authenticate your credentials. This way, you can disconnect your account from Lily at any time and continue to sign in with an email address and password. While we were making it possible to sign in through your Google or Microsoft account, we also streamlined the registration process for new users and made some updates to the way the log-in page looks. 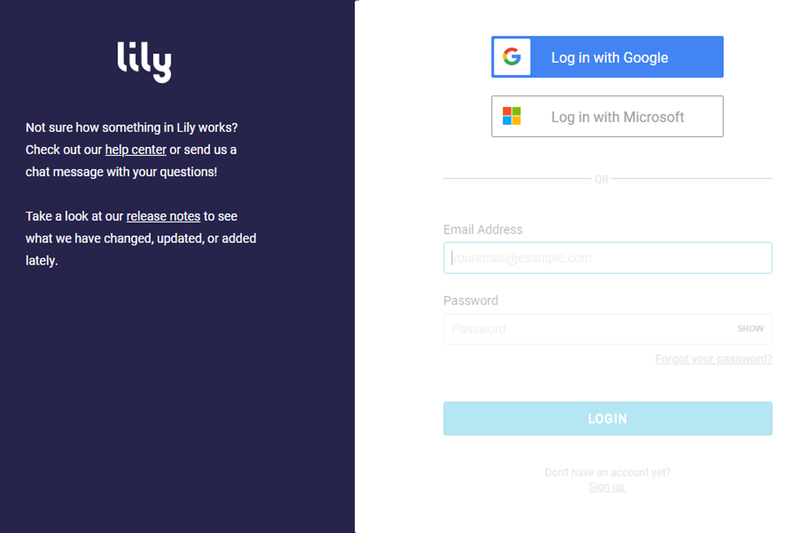 If you are curious how the new registration process looks, or how linking your Google or Microsoft account works, now is the perfect time to invite your colleague to join you using Lily! They can show you how our new registration process looks, and you can show them how to use Lily to make your customer communication better. One thought on "Logging in with Speed and Style"